Global Protective & Marine Coatings Market was valued at $18,437 million in 2016, and is expected to garner $31,047 million by 2023, registering a CAGR of 7.7% during the forecast period 2017 - 2023. The protective & marine coatings are used to guard the base construction materials from corrosion and moisture. These coatings, when regularly applied, offer a long-range protection that extends the life expectancy of a structure. There are various types of equipment & buildings that require a protective and/or finish coating, based on environmental requirements and materials involved. Marine coatings play a key role in protection from corrosion. They have the ability to protect effectively against oxidization for several years, which depends on technical parameters such as fundamental corrosion protection through galvanic, barrier or inhibition effects, enhanced adhesion properties, higher mechanical strength, and crack-resistant properties. The global protective & marine coatings market is driven by the increase in infrastructure & construction projects in emerging countries, rise in demand for high performance coatings, and environmentally friendly protective coatings. The constant need for repair & maintenance in ships/boats is a contributing factor for the market growth. However, strict environmental regulations on production and usage of protective coatings are expected to restrict the market growth in future. Mergers are expected to remain as the key strategy of the players to widen their brand portfolios and expand the market outreach. The report segments global protective & marine coatings market based on resin type, end-use industry, and geography. Based on resin type, it is classified into epoxy, polyurethane, acrylic, alkyd, polyester, and others. Based on end-use industry, it is divided into marine, oil & gas, industrial, construction, energy & power, transportation, and others. Geographically, it is analyzed across North America, Europe, Asia-Pacific, and LAMEA. 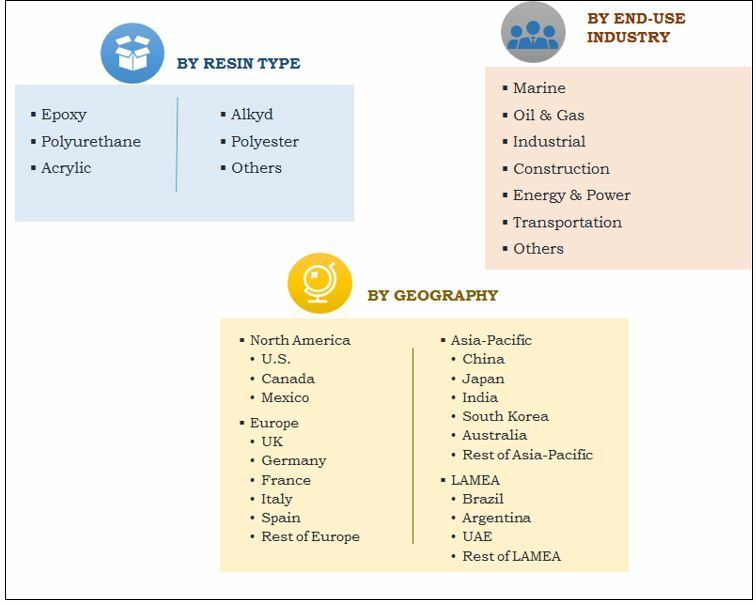 In 2015, the polyurethane segment accounted for over one-third of the global market share, in terms of volume. Polyurethane & epoxy resins are the top investment pockets in the market, attributed to the varied customization options available and ease in application over other resin-based coatings. Thus, this segment is anticipated to provide high stability and significant return on investment for the stakeholders, owing to its high growth rate and significant revenue contribution. Consumption of protective & marine coatings in North America and Asia-Pacific is expected to increase, owing to the increase in shale gas exploration and construction industry. Emerging markets, such as China and South Korea in Asia-Pacific, are expected to witness the highest demand during the forecast period, owing to the substantial growth in construction sector. Major companies have adopted agreement, product launch, expansion, and merger strategies to sustain the intense market competition. Key players profiled in the report include 3M Co., AkzoNobel N.V., BASF SE, Hempel A/S, Kansai Paints Co., Ltd, Nippon Paints Co. Ltd., PPG Industries, Inc., The Sherwin-Williams Company, The Dow Chemical Company, and Wacker Chemie AG. The other players (not profiled in the report) operating in this market are Axalta Coating System Ltd., Ashland Inc., Clariant International Ltd., Diamond Vogel Paints, Jotun A/S, RPM International, Inc., Royal DSM N.V., Solvay S.A., and Sono-Tek Corporation. This report provides an extensive analysis of the current trends, emerging estimations, and dynamics in the protective & marine coatings market. In-depth analysis of the market is conducted, and estimations for key segments between year 2015 and 2023 are provided. Competitive intelligence (of leading manufacturers and distributors) facilitates to understand the competitive scenario globally. Industry analysis is conducted by following key product benchmarking, positioning, and monitoring the top competitors within the global market. Key market players are profiled and their strategies are analyzed thoroughly to determine the competitive outlook of the industry trends. Currently, environmental protection paint has enhanced. There are more investments in the field of non-hazardous chemical materials, owing to the progress in formulation & technology. This trend has led the raw material to grow in price, such as resins, additives, and pigments. The coatings market is witnessing steady growth rate, such as threat of environmental regulations and alternatives. Regulatory and environmental issues drive the paint & coatings industry to update continually. Paint manufacturers focus on reducing the volatile organic compound (VOC) content in solvent-based paints, waterborne coatings, powder coatings, and other high-solids formulations, resulting to increase in the market share. The Asia-Pacific protective & marine coatings market presents promising opportunities, owing to high growth rate of the infrastructure in emerging countries. Moreover, the demand for epoxy, polyurethane, and acrylic resin is expected to increase in emerging countries, owing to growth potential for construction industry and demand for environmental coatings. "Protective & Marine Coatings Market"